Distance between columns 1200 mm. Throat depth (outgoing) 0 mm. Travel of cylinder / piston 150 mm. Maximum table-beam distance 340 mm. Back gauge range 800 mm. Maximum work rate 0-10 mm/sec. Bending length 1670 mm. 2100 mm. Distance between columns 1300 mm. 1600 mm. Throat depth (outgoing) 300 mm. 300 mm. Travel of cylinder / piston 200 mm. 200 mm. Maximum table-beam distance 400 mm. 400 mm. Back gauge range 800 mm. 800 mm. Working height 950 mm. 950 mm. Fast approach 200 mm/sec. 200 mm/sec. Maximum work rate 0-10 mm/sec. 0-10 mm/sec. Return speed 200 mm/sec. 200 mm/sec. Oil capacity 40 l. 40 l.
Distance between columns 2100 mm. Throat depth (outgoing) 400 mm. Travel of cylinder / piston 300 mm. Maximum table-beam distance 500 mm. Bending length 2600 mm. 3100 mm. 4100 mm. 5100 mm. 6100 mm. Distance between columns 2100 mm. 2600 mm. 3600 mm. 4600 mm. 5600 mm. Throat depth (outgoing) 400 mm. 400 mm. 400 mm. 400 mm. 500 mm. Travel of cylinder / piston 300 mm. 300 mm. 300 mm. 300 mm. 300 mm. Maximum table-beam distance 500 mm. 500 mm. 500 mm. 500 mm. 500 mm. Back gauge range 800 mm. 800 mm. 800 mm. 800 mm. 800 mm. Working height 950 mm. 950 mm. 950 mm. 950 mm. 1075 mm. Fast approach 200 mm/sec. 200 mm/sec. 200 mm/sec. 180 mm/sec. 150 mm/sec. Maximum work rate 0-10 mm/sec. 0-10 mm/sec. 0-10 mm/sec. 0-10 mm/sec. 0-10 mm/sec. Return speed 200 mm/sec. 200 mm/sec. 180 mm/sec. 160 mm/sec. 130 mm/sec. Oil capacity 100 l. 100 l. 100 l. 100 l. 100 l.
Throat depth (outgoing) 500 mm. 500 mm. 500 mm. 500 mm. 500 mm. Oil capacity 150 l. 150 l. 150 l. 150 l. 150 l.
Bending length 3100 mm. 4100 mm. 5100 mm. 6100 mm. Distance between columns 2600 mm. 3600 mm. 4600 mm. 5600 mm. Throat depth (outgoing) 500 mm. 500 mm. 500 mm. 500 mm. Travel of cylinder / piston 300 mm. 300 mm. 300 mm. 300 mm. Maximum table-beam distance 500 mm. 500 mm. 500 mm. 500 mm. Back gauge range 800 mm. 800 mm. 800 mm. 800 mm. Working height 965 mm. 965 mm. 985 mm. 1075 mm. Fast approach 200 mm/sec. 200 mm/sec. 160 mm/sec. 150 mm/sec. Maximum work rate 0-10 mm/sec. 0-10 mm/sec. 0-10 mm/sec. 0-10 mm/sec. Return speed 180 mm/sec. 180 mm/sec. 150 mm/sec. 130 mm/sec. Oil capacity 200 l. 200 l. 200 l. 200 l.
Working height 965 mm. 965 mm. 965 mm. 965 mm. Fast approach 180 mm/sec. 180 mm/sec. 150 mm/sec. 150 mm/sec. Maximum work rate 0-8,5 mm/sec. 0-8,5 mm/sec. 0-8,5 mm/sec. 0-8,5 mm/sec. Return speed 180 mm/sec. 180 mm/sec. 140 mm/sec. 120 mm/sec. With our vast experience and industry knowledge, we have incorporated as a standard on our machines, all the equipment necessary to provide flexibility and speed that allows customers to minimize production costs. All machines are designed to use the latest technology and the best materials. Hydraulic press brakes are used for sheet metal working today due to their flexibility and production capacities, they are an essential tool in any production process in the metal sector. 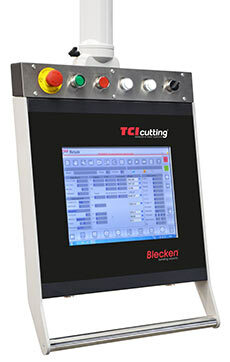 Thanks to our experience in this sector, we are able to offer one of the best products with the TCI Cutting service. 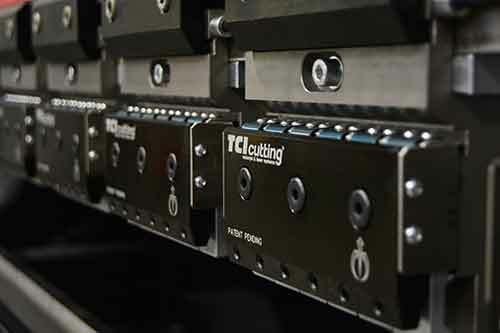 The TCI press brakes incorporate a control panel for easy operation by the operator and a control of the operations. The controlling of all systems is performed by CNC, enabling our press brakes reach a maximum level of precision and automation that allows high productivity and low costs. Flex device to compensate deviations in the bend. Clever system (optional). Table compensation controlled by CNC. IRS PLUS system. Optical system that also allows control of the bending angle. Automatic upper and lower interlocking system. European and Willa type clamping possible. CNC controlled back gauges. Standard 6 axis, optional 8 axis +1. Reinforced structure that eliminates possible deviations over time. Mechanical Systems of last generation that ensure high performance. Individualized hydraulic system per piston that allows both power and precision. Robust worktable prepared for automatic clamping.